Symphony in White, No. 3 was originally signed and dated 1865, the date being later altered to 1867. 1 It may then have been worked on occasionally until 1873. In November 1865 Whistler's mother Anna Matilda Whistler (1804-1881) wrote to him, 'I hope you may add to the Sofa as many beautiful touches as you did to the little white girl & that Houth [sic] may be so charmed he may add more of Whistlers to his own collection.' 4 This suggests that Louis Huth (1821-1905) bought it before it was completed. Translation: 'My brother is bringing the little painting with him. I would be very glad to know that it was in the salon of the Club. ... I would very much like to have a little word from you to tell me if you like it. You will clearly see that I still have little things to do to complete it altogether - the hands are only sketched in - I shall also touch up the flowers later. This probably refers to Symphony in White, No. 3 [YMSM 061], and implies that Whistler was still working on it. A comparison of the present state of the oil with an early photograph (Lucas Collection, Baltimore) taken before the date was changed in 1867, shows several minor alterations, which could date from early 1867, before the oil was exhibited at the RA. 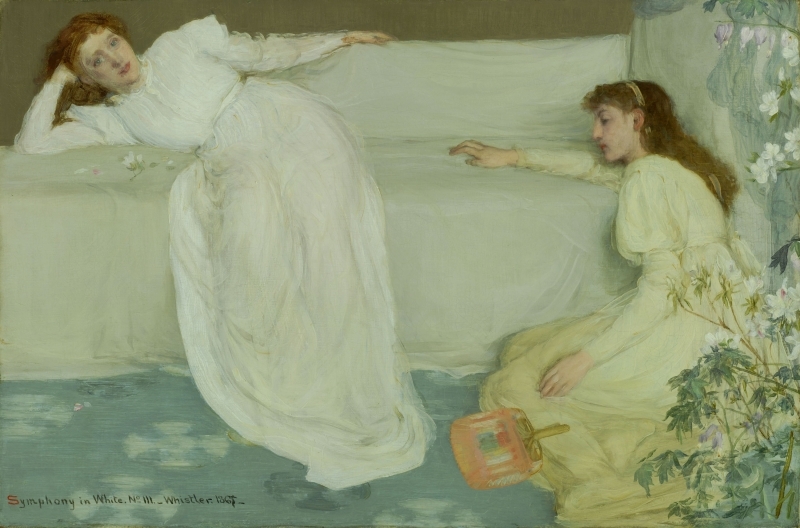 On 31 March William Michael Rossetti (1829-1919) called in to see what Whistler intended to send to the Academy: 'he means to send Symphony in White No. 3 (heretofore named The Two Little White Girls).' 8 It was exhibited at the 99th Exhibition of the Royal Academy of Arts, London, 1867 (cat. no. 233) as 'Symphony in White No. 3'. 1868: In February and March 1868 one of the models, either Emilie ('Millie') Jones or her sister Augusta Maria Jones (fl. 1865), was still posing for Whistler, possibly for this oil, at the studio of Frederick Jameson (1839-1916) at 62 Great Russell Street, London. 9 Joanna Hiffernan (b. ca 1843-d.1886) was probably also posing at that time. 1873: In January Whistler told Louis Huth that the 'two figures' painting was one of two requiring further work that he would undertake 'directly the Academy work is over - and you can see as they progress whether you like to keep them for yourself.' 10 It was exhibited in the Sixth Exhibition of the Society of French Artists [Summer Exhibition], Deschamps Gallery, London, 1873 (cat. no. 112). 1: YMSM 1980 [more] (cat. no. 61). 2: 16 August , GUW #11477. 3: [1864/1865], GUW #09393; but see La Princesse du pays de la porcelaine [YMSM 050]. 4: A. M. Whistler to Whistler, 25 November , GUW #06526. 5: 17 January , GUW #09171. 6: Notebook 20 (Louvre RF5634, p. 17). Reff 1976a [more], repr. 7: [13/20 February 1867], GUW #08145. 8: Spencer 1989 [more], p. 79. 9: Whistler to 'Miss Jones', [February 1868/May 1869], GUW #09173, and [February 1868/1869], GUW #09175. 10: [31 January 1873], GUW #02242.